Tag Archive | "trade gap"
The daily news shows us again and again how we can take advantage of the dollar’s strength now for future profits. The chart above is from the New York Times article Dollar’s Rise Lifts Imports and Widens Trade Gap. This article highlights how the strength of the US dollar helped create March’s trade deficit of $51.4 billion. The 43 percent increase over February’s gap of $35.9 billion., was the highest gap in six and a half years. That gap comes in part because the dollar has been gaining in value against other currencies, making foreign goods cheaper for American consumers to buy. The cost of making US goods (in terms of other currencies) in US factories rises as the dollar strengthens. Dollar strength is weakening the US economy, because American manufacturers cannot compete abroad nor can they compete against importers selling into the USA. The key to good value investing is to invest on the future and sell to the thundering herd. Much of the world has been investing in the US dollar, so it is time to use these strong dollars and accumulate good investments in other currencies. Reduced foreign trade becomes a drag on the economy and the strong greenback is just one economic pitfall for the USA. The senate handed President Obama a delay on the Asian trade agreement with 11 Asian nations. The 11 countries involved are some of the fastest-growing economies in the world and create over a third of the the world’s output and a quarter of its goods and service exports. Such gaps cannot continue. Eventually market forces would balance trade. Government intervention is more likely to take place first. The dollar strength today is very similar to 1980 when over a five year period it appreciated and lost 50% against all major currencies. This hurt American businesses and created a rising trade gap in the same way it is now. Representatives from the governments of Japanese, Germany, France and Britain, met at the Plaza Hotel in New York and agreed to devalue the dollar to make U.S. exports cheaper so other countries could buy more American-made goods and services. The devaluation was orderly and the dollar exchange rate versus the yen and other major currencies declined by 51% from 1985 to 1987. Should this happen again, investment in the Euro can gain as much as a 50% profit boost. Because markets move faster today than in the 1980s and because the private investing sector has more clout in currency markets than three decades ago, the dollar’s fall could be far more rapid then in the 1980s. This is why my report “Three Currency Patterns For 50% Profits or More.” described below recommends investing in good value European equities on a systematic basis. The report shows 22 good value investments and a really powerful tactic to use that allows you to accumulate these bargains now even in very small amounts (even $5,000). There is extra profit potential of at least 50% so the report is worth a lot. The ultimate investing secret is the simple fact that investment opportunities come and go in cycles. Because we have been watching the trends for decades, we spot many distortions we saw decades ago as they create repeat opportunities. For example, our 1986 report “The Silver Dip” showed readers how to turn $250 into over $45,000 in a year. When we spotted the same repeat distortion in silver’s price in 2015, we issued our report “Silver Dip 2015”. Those who acted on the report made as much as 200% in 2016. There is another phenomenal distortion that has been building for a number of years. Here is how I (and you can as well) am cashing in on this trend. “If I Live Long Enough, I’ll really cash in next time”. I made this promise to myself in the 1980s. A remarkable set of economic circumstances helped anyone who spotted them become remarkably rich. Some of my readers made enough to retire. Others picked up 50% currency gains. I invested as much as I could handle then as the profits rolled in for about 17 years. Then the cycle ended. Warren Buffet explained the importance of this ending in a 1999 Fortune magazine interview. He said: Let me summarize what I’ve been saying about the stock market: I think it’s very hard to come up with a persuasive case that equities will over the next 17 years perform anything like—anything like—they’ve performed in the past 17! Now I see those circumstances headed our way again. The Dow Jones Industrial recently soared past 20,000 and reached an all time high. So why aren’t average investors all rich? There are several answers. First, even though the Dow has peaked, for the last 17 years the US stock market has been in a bear trend. You’ll see why in a moment. Another reason why the investors have not done so well is because of currency loss. One final reason why profits have not been so good. Someone, probably someone you trust, has been stealing from you. One of the biggest obstacles in profiting from the upcoming circumstances has been and remains the financial system. The reality is that banks and brokers have been structuring investments that are sure to lose. They sell you on these investments and then another division of the very same bank (or broker) that recommended the investment, bets against you. The bank knows that the investment is toxic. To add insult to injury, many of these same institutions cheat you on the way in and the way out (when you buy and sell a share) of the bad investment. Most brokers and bankers are interested in your money making them rich, not in helping increase your wealth. Three Patterns Create 50% profits. Despite the predators on Wall Street who are waiting to take big gouges out of your savings and wealth, equities are still the best place to invest for the long term. 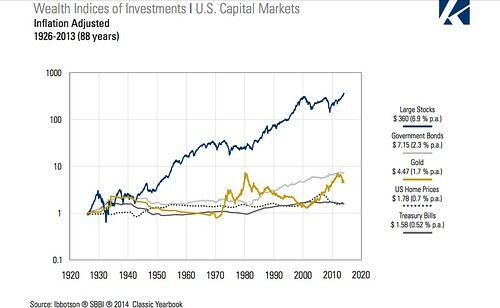 This chart from the 24 page Keppler Asset Management Asset Allocation Review shows that over the past 80+ years equities have dramatically outperformed other types of investments. Good investments require a relentless search for value. Your investments have to be good enough to reap an outstanding profit even after the parasites siphon off their part. To take advantage of the once every 17 year circumstances, I chose to track Keppler Asset Management who continually researches developed and emerging markets globally. Keppler is one of the best market statisticians in the world and numerous very large fund managers use his analysis to manage funds such as State Street Global Advisors. Keppler compares the value of each share in each market based on current book to price, cash flow to price, earnings to price, average dividend yield, return on equity and cash flow return. From this study of monumental amounts of data Keppler develops a Good Value Stock Market Strategies. The analysis is based on long term, rational, mathematical facts and does not worry about short term ups and downs. From Keppler I learned that market timing is not the way to get these high profits. Another graphic from the Keppler Asset Allocation Review explains why. 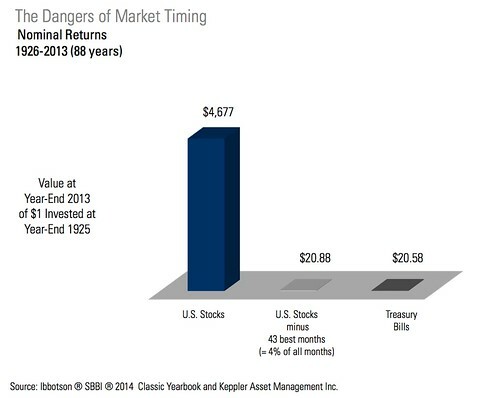 The better alternative to timing is to invest in long term indexing based on value. Long term strategic investing in market indices reduces the amount of trading. Low trading activity is important because trades are where investors are most vulnerable to predatory tactics. A part of the long term strategic trading is to invest in low fee diversified Country Index ETFs. This simplifies the search for value because it focuses research into lumps. A comparison of US versus German stock market indexes gives an example of lump research and you can create good value, low cost, diversified portfolios that offer maximum potential for profit as they reduce risk. Keppler’s research shows that Germany’s stock market is a good value market. Keppler lumps all the shares (or at least 85% of the shares) into the calculations. There is no attempt to select any one specific share. Keppler’s research shows that the US stock market index (a lump of about 85% of all the US shares) is now a poor value. Germany has the world’s fourth largest economy. The country is the third largest exporter in the world and has recorded some of the highest trade surplus in the world making it the biggest capital exporter globally. Yet German shares have been overlooked. German share prices are good value. For example, recently the German Stock Market had a relative price to book value ratio of .78, a relative price earnings ratio of 0.87 and a relative dividend yield of 1.12. The US Stock Market has a much higher relative price to book value ratio of 1.29, a relative price earnings ratio of 1.07 and a relative dividend yield of 0.81. German shares cost much less, compared to the values and earnings. German shares pay much higher dividends as well. Keppler predicts that the US Stock Market (which is ranked as a sell market by Keppler) will have an annual index gain for the next five years of 3.1% and a total return (with dividends) or a total five year return of 21.7%. The same calculations for the German Market predicts an average annual index gain over the next five years of 7.5% and a total return (with dividends) or a total five year return of 47.3%. Which would you rather buy, a 47.3% return sold for 78 cents on the dollar or a 21.7% return sold for $1.29 on the dollar? You can forget about any specific share in the US or Germany and invest into an index (in this case the Morgan Stanley Capital Index) which represents about 85% of all the shares traded on the exchange. You can invest in ETFs that passively invest in all the shares of the index in stock markets that offer good value. iShares investment company for example has an ETF that invests in 85% of the shares traded on Wall Street. 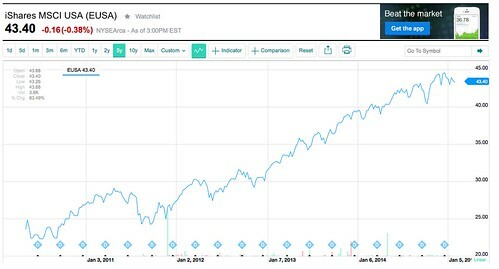 This ETF is called the iShares USA (symbol EUSA) and in this example rose from $22.91 to $43.40 or 89% in the past five years. iShares also offers an ETF that invests in about 85% of the stocks listed on the German Stock Exchange (Symbol EWG). EWG rose from $19.70 to $28.13 or 42% in the past five years. Keppler’s lump research shows that Germany is a good value market. One simple (even very small) investment in iShares Germany MSCI Index ETF gives you a portfolio of almost all the shares traded on Germany’s largest stock exchange in Frankfurt. This ETF is a share traded on the New York Stock Exchange. The ETF invests in 85% of the shares in Germany. This ETF is a passive fund that does not try to outperform the growth of the German Stock Market. The managers simply track the investment results of the MSCI Germany Index. The MSCI Germany Index is designed to measure the performance of the large and mid cap segments of the German Index which is composed of the stocks of 54 different German companies and covers about 85% of all the German equities. Germany’s ten largest companies compose about 60% of the index. These ten companies are: BAYER (Health Care) composes 9.91% of the index – SIEMENS (Industrials) 7.89% – DAIMLER (Consumer Discretionary) 7.04% – BASF (Materials) 6.81% – ALLIANZ (Financials) 6.65% – SAP STAMM (Info Tech) 5.69% – DEUTSCHE TELEKOM (Telecom Srvcs) 4.46% – DEUTSCHE BANK NAMEN (Financials) 3.66% – VOLKSWAGEN VORZUG (Consumer Discretionary) 3.18% – BMW STAM (Consumer Discretionary) 3.15%. You lump your research. You lump your investment. This makes it easy to capture the powerful economic circumstances that are unfolding now. Just investing in Germany is not enough. There are currently ten good value developed markets, Australia, Austria, France, Germany, Hong Kong, Italy, Japan, Norway, Singapore and the United Kingdom. Plus there are 11 good value emerging markets. With even a couple of thousand dollars you can easily create a diversified portfolio in each or all of these countries with Country Index ETFs. Investing in many stock markets through ETFs gives you opportunity in the second pattern of the falling US dollar. Preserving the purchasing power of your savings and wealth requires currency diversification. The strength of the US dollar over recent years is a second remarkable similarity to 30 years ago. In 1980, the dollar rose along with Wall Street. Profits came quickly over three years. Then the dollar dropped like a stone, by 51% in just two years. A repeat of this pattern has been growing, is seriously overdue and could create up to 50% extra profit if you start using strong dollars to accumulate good value stock market ETFs in other currencies. 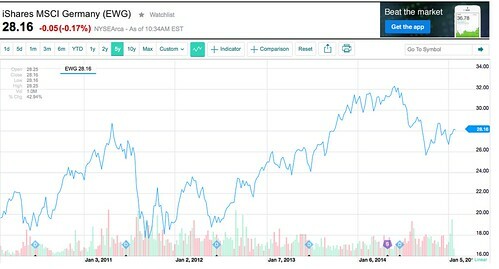 For example because of fears about the euro, EWG, the German ETF dropped 9 percent in 12 months. These declines are created by currency concerns. When the euro regains strength, the shares have the potential to appreciate even more. This is the most exciting opportunity I have seen since we started sending our reports on international investing ideas more than three decades ago. The trends are so clear that I created a short, but powerful report “Three Currency Patterns For 50% Profits or More.” This report shows how to earn an extra 50% from currency shifts with even small investments. I kept the report short and simple, but includes links to 153 pages of Keppler Asset Stock Market and Asset Allocation Analysis so you can keep this as simple or as complex as you desire. Order now and I’ll email the online report “Three Currency Patterns For 50% Profits or More” in a .pdf file right away. I guarantee you’ll learn ideas about investing that are unique and can reduce stress as they help you enhance your profits through slow, worry free purposeful investing. If you are not totally happy, simply let me know within 60 days and I’ll refund your subscription fee in full, no questions asked. You can keep “Three Currency Patterns for 50% Profits or More” as my thanks for trying. I look forward to the next 17 years and sharing how to have more than enough money for the rest of your life.